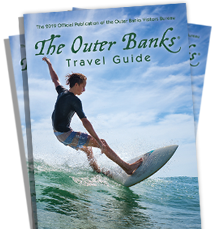 OUTER BANKS, N.C. -- As far as coastal vacation destinations go, the Outer Banks of North Carolina has an incredible history. From the birth of a nation to the birth of aviation, the Outer Banks has played a key role in the history of North Carolina, the country and the world. The barrier islands of the Outer Banks were created thousands of years ago from a high ridge of sand dunes that survived the melting of the earth’s glaciers. Barrier islands earn their name by shielding the coastal mainland from the ocean’s surging waves and storms. Each chain of barrier islands is unique depending on the weather and tides in its area. Because the waterways and coast along the Outer Banks is in constant motion, its wide variety of climates, wildlife and landscape is ever-changing. The Outer Banks of North Carolina are thought to have been inhabited by humans more than 10,000 years ago. Historians believe the first people to live on the chain of islands were the Carolina Algonkians, also known as Croatans, who lived near Cape Hatteras from approximately 1000 to the 1700s, when contact with European explorers led to the demise of the tribe. Italian explorer Giovanni de Verrazzano, the first European explorer to land in the Outer Banks in 1524, mistakenly believed the chain of islands to be an isthmus dividing the Atlantic and Pacific Oceans. Sixty years later, Sir Walter Raleigh dispatched English explorers Philip Amadas and Arthur Barlowe, who successfully navigated an entrance through the islands to the coast. The explorers’ two ships landed at Roanoke Island, where crews disembarked and found a land of abundant resources and peaceful natives. More than 40 English ships visited the Outer Banks over the next three years, allowing the English to gain a foothold in colonizing the New World. In order to further colonize the New World, Sir Walter Raleigh sent an expedition of three ships led by John White to the Outer Banks. The expedition, which included women and children for the first time, arrived at Roanoke Island in 1587. Colonists used the abandoned cottages, fort and military quarters of former British explorers for a permanent settlement. One month after their arrival, Virginia Dare, granddaughter of Gov. John White, was born as the first English child on American soil. Shortly thereafter, John White left the 117 colonists on the Outer Banks to return to England for food, supplies, and more colonists. However, due to war with Spain, White was unable to come back to the American settlement for three years. When he returned, the colony had disappeared. Roanoke’s houses were deserted and its treasures gone. White’s family and the other English colonists had vanished, leaving no trace except for two cryptic carvings: “CRO” was scratched into the trunk of one tree near the bank of the Roanoke Sound and “CROATOAN” was etched into another, near the deteriorating fort. These mysterious messages led White to believe the settlers had gone to live with friendly Croatans on Hatteras Island. There were no signs of struggle or violence at the deserted settlement site. Theories about the colony’s disappearance vary. Some say the colonists were killed by natives or carried away in a skirmish. Others think they attempted to sail home to England and were lost at sea. Still others believe they left to explore the Carolina mainland or other areas of the Outer Banks. The fate of the Lost Colony has been debated by historians for more than 400 years, and remains unknown today. The intriguing mystery has inspired “The Lost Colony,” America’s longest running outdoor symphonic drama, which has reenacted Roanoke’s story for more than 60 years at Waterside Theatre in the Fort Raleigh National Historic Site on Roanoke Island. With its shifting sands and storms, the coastline of the Outer Banks proved treacherous for many ships. Hurricanes and nor’easters, which still threaten the Outer Banks, ended the voyages of many ships and hundreds of lives. Because its shoals became the burying grounds for many ships, the shores of the Outer Banks were dubbed the Graveyard of the Atlantic by American statesman Alexander Hamilton. After the Civil War, steamers replaced sailboats that once traveled the Outer Banks’ coast. Yet even these iron vessels succumbed to the Outer Banks’ dangerous shores. In 1874, seven U.S. life-saving stations were established on the Outer Banks to help save sailors’ lives and salvage ships. The stations’ keepers, known as surfmen, were mostly rugged Outer Banks natives who patrolled the shores at all hours of the day and night, ready to rush into the surf at the first sign of a ship or sailor in trouble. The Outer Banks’ life-saving stations witnessed many maritime firsts, including the first all-African American surfmen staff at the Pea Island station. Outer Banks surfmen invented a lifesaving device known as the "breeches buoy" to haul shipwreck and storm victims onto the shore. The device’s pulley system was attached to a life preserver fitted with short pants, which kept victims afloat in even the highest seas. Before becoming part of the U.S. Coast Guard in 1915, the Outer Banks lifesaving stations saved thousands of lives during hurricanes and storms. When the Civil War erupted in 1861, the inlets of the Outer Banks became important military targets. The Hatteras and Ocrcoke inlets became encampments for both sides of the conflict. Nearly 600 Confederate soldiers were stationed at Fort Hatteras and Fort Clark on opposite sides of the Hatteras inlet. Several months later, Union troops had pushed opposing forces north to the Confederate stronghold of Roanoke. Union forces numbering 11,500 soldiers launched an attack on Roanoke Island in February 1962, after which 1,050 Confederate were forced to surrender. Union troops held Roanoke Island and most of the Outer Banks for the rest of the Civil War. Many Outer Banks landmarks suffered the destruction of war. The original Cape Hatteras Lighthouse was destroyed by Union forces. Confederate soldiers blew up the Bodie Island Lighthouse to prevent their Union enemies from using it as an observatory. As Confederate forces retreated from Roanoke Island, the Outer Banks became home to thousands of former slaves. The refugees settled near the Union headquarters, creating churches, a school and a community that evolved into a government-sanctioned colony – later called the Freedman’s Colony. Major General John G. Foster, Commander of the 18th Army Corps, ordered Union chaplain Horace James to establish a colony for former slaves and the families of black Union soldiers. In the summer of 1863, James designed a New England-style village stretching from Weir’s Point to Pork Point on the north end of Roanoke Island. Freed slaves were provided with lots to build their own homes and jobs in shad fisheries and the sawmill. The colony became a self-sufficient village, growing from about 1,000 former slaves to 3,500 free American citizens at the end of the Civil War. Although most of the combat of World War II was waged on other continents, the Outer Banks was the site of some military action. German U-boats prowled the coast along shipping lanes, destroying at least 60 Allied vessels and lending the treacherous wartime waters of the Outer Banks the nickname “Torpedo Alley.” The enemy submarines experienced losses as well. The first German U-boat sunk by Americans lies in a watery grave off the coast of Bodie Island. This coastal area has a greater concentration of sunken U-boats than any other place on the American coast. Many Outer Banks residents recall blackouts each night during the war to prevent enemy ships from detecting the shoreline. The Outer Banks became known as “Home of the First Flight” following the monumental aviation event that took place over 100 years ago on Dec. 17, 1903. Bicycle shop owners Orville and Wilbur Wright spent years developing the 40-foot glider that would become a history-making aircraft. As their glider lifted off the ground at 10:35 that morning, the Wright Brothers achieved the first successful powered flight along the beaches of Kitty Hawk. Though the glider flew for only 12 seconds and 120 feet, it was an accomplishment that forever changed the world. For more information about the Outer Banks and its history, contact the Outer Banks History Center at (252) 473-2655.